2007 Allora is near Warwick on the Darling Downs. 1910 Photo 5 Oct building opened, in Current Accounts July 1972. State Library of Qld annotation: "Large group of people gathered in front of the new branch of the Commercial Banking Company of Sydney, Ltd., at Allora in 1910. The bank first opened a branch in the area in 1906." Drawing in Current Accounts April 1979 by A. Payton, Manager. Stained glass window from Current Accounts April 1979. 2007 August photo from Des Leggett. He relieved there in 1961. The branch obviously has a preservation order on it for on the front window still remains "The Commercial Banking Company of Sydney". A dentist currently occupies the premises. 2008 July photo is of NAB Atherton, Q'land, taken during a visit there in July this year by Frank Maundrell who says: I do not know whether it is the site of the old CBC Bank. 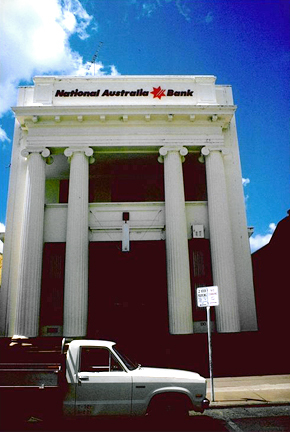 The National Australia Bank with its Classical temple front is a representative example of the inter-war Academic Classical style (Criterion D.2). It was built during a phase of building and rebuilding of banks throughout Australia, using a style and Classical details to express the image of a solid banking enterprise (Criterion A.4). It is typical of the work of the architect Lange L Powell who designed other buildings for the National Australia Bank in the Classical style including the headquarters of the Bank in Brisbane (Criterion H.1). A two storeyed rendered masonry building, designed with a temple front in the inter war Academic Classical style. Four giant fluted Ionic columns rise up through the facade and support the cornice and parapet. The upper level has an open balcony beneath which is the entrance lobby. 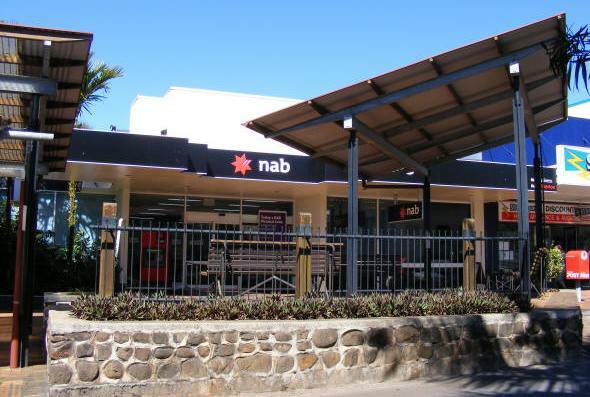 This bank is a typical example of the work of the architect Lange L Powell who designed other banks for the National Australia Bank, including the headquarters of the Bank in Queen Street, Brisbane and a bank at Mossman. The latter also having a Classical temple front. Location: 130 Queen Street (Bruce Highway), Ayr.